In January 2018, a team of researchers from the University of Aveiro (UA) travelled to the Bijagós archipelago (Guinea-Bissau) to set in motion field investigations on waders, as part of a larger initiative aiming at securing the ecological integrity of the Bijagos archipelago as a key site for waders along the East Atlantic Flyway. This international collaborative project is funded by MAVA and coordinated by IBAP – Instituto da Biodiversidade e das Áreas Protegidas with the involvement of several partners from Guinea-Bissau, Portugal and the Netherlands. Despite many challenges the team from UA has, among other things, worked towards understanding the connectivity established by the waders of the Bijagós with other sites along the East Atlantic Flyway. During the first field-camping that lasted until March 2018 the team captured a total of 465 waders using mist-nets, 332 of which were marked with individual combinations of colour-rings. This allows observers from across the flyway to record and report the movements of these birds and that is exactly what has already happened to one of the Grey Plovers (Pluvialis squatarola). 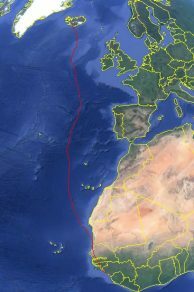 Ringed on the island of Formosa on 17 February 2018, it was subsequently recorded in Malaga, Spain on 6 May 2018 – 79 days after having been released in the Bijagós and having migrated 3,014 km north on its journey towards its high arctic breeding grounds. Meanwhile, from the opposite end of the flyway, research in Iceland has also provided some very interesting links with West Africa. 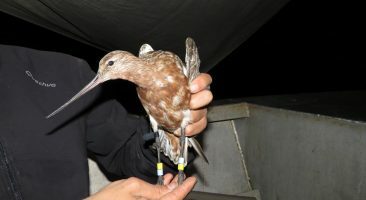 The researchers managed to download some of the data contained in a GPS-tagged Whimbrel (Numenius phaeopus) , revealing a direct flight from Iceland to Bolama island in Guinea-Bissau. This Whimbrel left Iceland in August 2017 and travelled 5,800 km in one single go, flying non-stop for about three and half days! The work undertaken by the University of Aveiro is important to establish the connections throughout the East Atlantic flyway, of which the Bijagos archipelago is a major wader hub. These activities are part of MAVA funded Action Plan on halting the disturbance of breeding and wintering shorebirds.